Immaculate. Elegant. Breath Taking. These are the words that come to mind upon entering 118 Summerhill Court. This Gorgeous end unit Townhome offers an opportunity for truly luxurious living. 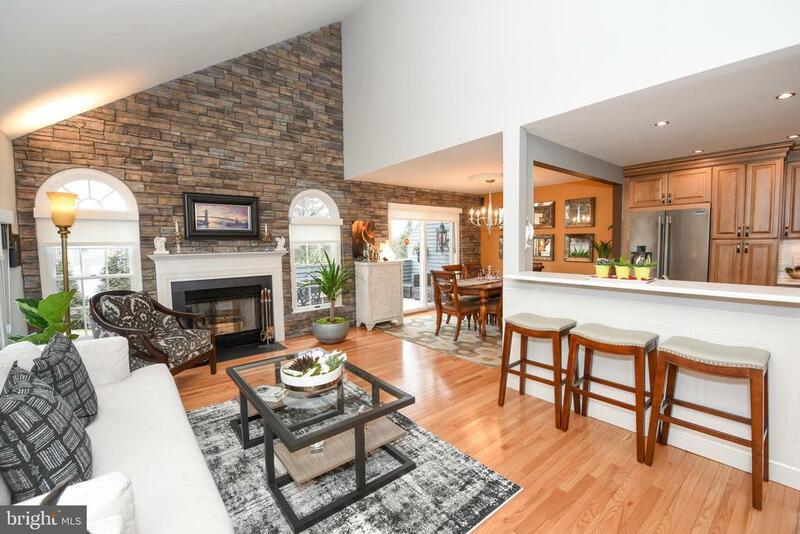 Note the stone accent walls, vaulted ceilings, and hardwood floors throughout the home. Finer touches~ offer a radiant warmth, making for an authentic and welcoming experience in every facet. The open concept Living room flows perfectly into both the Dining room and the Kitchen. In the Kitchen, you~ll find beautiful top of the line cabinetry accented by a flawless quartz countertop, tasteful porcelain tile floors, and an exquisite tile backsplash. The Dining room allows for wonderful views of the deck at the rear of the home and the surrounding neighborhood, an intimate and cultured setting for conversations and dining alike. From here the home flows into the much sought after first floor Master Suite. This private oasis offers seclusion and convenience all in one. Walk into the Bedroom area and experience for yourself the invigorating and airy feeling of this room as the gorgeous vaulted ceilings and many large windows surround you. Traveling back down the hallway you~ll find the Master Bathroom equipped with a massive seamless glass shower and extensive tile masonry (with built in bench seating a waterfall and a handheld shower-head), and a fantastic marble top vanity and floors. Before ascending to the second floor take note of the adjacent half bathroom a chic and modern room sure to impress any guests. As you climb the stairs take note once again of the matching stone accent walls in both the Living Room and Stairwell tastefully paired with an open concept staircase and perfectly placed recess lighting, creating an inviting glow. On the Second floor, you~ll find a large bathroom with stylish glass tile accent walls and trim around the tub alongside a marble top vanity, making for a truly regal atmosphere. The second Bedroom is currently being used as a second Living room. This room offers two large skylights allowing for ample sunshine, as well as, a built-in desk/vanity and wonderful vaulted ceilings and a large walk in closet. There is also an additional bedroom with a large walk in closet at the opposing end of the hall. The home also offers a full unfinished basement space offering plenty of room for additional storage, and a one car attached garage with inside access. Exclusions: Light Fixture in Dining Room, Washer Dryer, Refrigerator, Stove, Microwave Oven. (All exclusions are negotiable see list agent for details). Inclusions: Some furnishings are negotiable, see list agent for details.